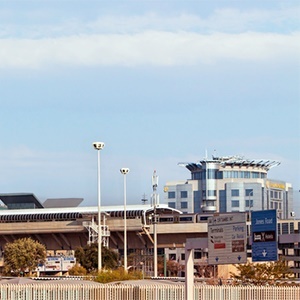 Cape Town – As airport security tightens across the world, OR Tambo International Airport has officially recognised seven of the staff that works at one of SA's busiest airports, for the role they played in key drug busts that took place earlier this month. The staff, six security officers and one member of the cleaning staff, were visited by General Manager of OR Tambo International Airport, Bongiwe Pityi, and Comair Operations Director, Martin Louw to thank them for the great job they do at the airport before wishing them bon voyage on their journey. As part of the recognition approach by OR Tambo International Airport Management, four of the seven colleagues were flown to Cape Town to participate in and experience Cape Town International Airport’s premier stakeholder awards event. The other three received air tickets from Comair to enjoy the King Shaka International Airport Awards gala dinner evening that is an annual highlight for the aviation industry players in KwaZulu-Natal. Added to that, in recognition of the drug bust success, all seven colleagues will also be receiving their awards at the OR Tambo International Airport edition of Airports Company South Africa’s annual stakeholder awards event which is set to take place on Friday, 01 December. “These men and women have been working at the airport for years and in some instances have put their lives on the line for the benefit of other passengers," says Pityi. "Today, it is their turn to be our passengers and we are delighted that Comair has partnered with us to provide three of the seven colleagues with this opportunity." Pityi says it was important that they afforded all seven colleagues, an opportunity to travel to Cape Town and Durban respectively, for the two premier stakeholder awards events. "In this way, they get to experience how our other airports celebrate the contributions of the stakeholders within their airport communities,” she says. Pityi commends the colleagues for the ethos that underpins their work as excellence that is not a once-off activity but a continuous striving for a safe and secure airport. “I should also note that as we recognise these men and women for their role in securing our airport we have started to see positive impacts from the work of a joint operations committee that brings together Airport Management, the South African Police Service (SAPS) and other law enforcement agencies, local government, airport security contractors and other suppliers," she says, adding that, they are also seeing further lifting of morale among all airport staff as they see the benefits of the intensified security strategy. NOTE: Due to the nature of their work, OR Tambo International Airport has decided not to name the seven personnel.